Our contractors are trained to get to the bottom of your air conditioning repair problem and provide the solutions you need in Troutman. Nobody likes to deal with air conditioning repair, but it’s important that you call a service professional when you notice a problem, rather than waiting for it to get worse. At Cool Comfort Heating & Air, we can provide fast, efficient air conditioning repair that gets your unit working efficiently again, so you can get back to your normal routine in Troutman, North Carolina. We know that having a properly working air conditioning unit makes all the difference in your comfort and your energy bills, so if you are noticing a problem, all you have to do is give us a call. Air conditioning repair comes in many formats, from a blown fuse to clanking noises to emitting strange odors. 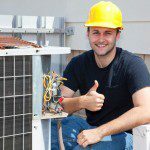 If you have noticed that your unit isn’t working like it should or your comfort level is affected because of your air conditioning system, then calling for air conditioning repair sooner rather than later could save you lots of time, stress, and money. Our air conditioning contractors are trained to get to the bottom of your air conditioning repair problem and provide the solutions you need for your home. We’ll offer expert recommendations for the necessary repairs and give you a clear idea of the cost, so you know what works for your budget. If you have an older air conditioner unit that should be replaced rather than repaired, you can also expect an honest answer from us. The good news is that we’ll always give you options and work with you to achieve your home comfort and energy efficiency goals. Contact us at Cool Comfort Heating & Air today for more information about our services and to schedule air conditioning repair at your home. At Cool Comfort Heating & Air, we provide high-quality air conditioning repair services in Mooresville, Huntersville, Cornelius, Denver, Lake Norman, Troutman, and Davidson, North Carolina. If you’re looking for reliable and affordable air conditioning or furnace repair in Lake Norman, North Carolina, contact us at Cool Comfort Heating & Air. Upgrade to a new system today & get a Honeywell Thermostat for FREE!